First up let me stop right there if you are looking for advice on the best ballheads for your tripod this this year. Ballheads deserve their own gear guide which I will no doubt do at a later date, just as I have already done with the best tripod gimbal heads of the year. 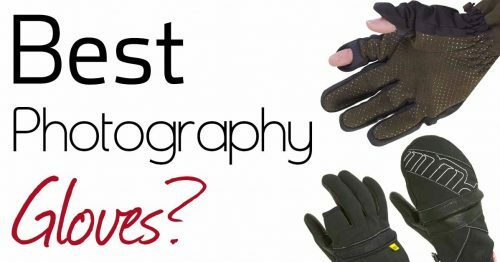 This post here is specifically dealing with support gear accessories that are not ballheads and gimbals. A good tripod is certainly one of the most important things in my photographic kit. Once I had come to terms with the rather large sticker price of my choice – a Really Right Stuff TFC-24L – I slowly added a few useful accessories to my kit that have improved my experience when using it, or worked as a substitute in a situation where a full-sized tripod was impractical. 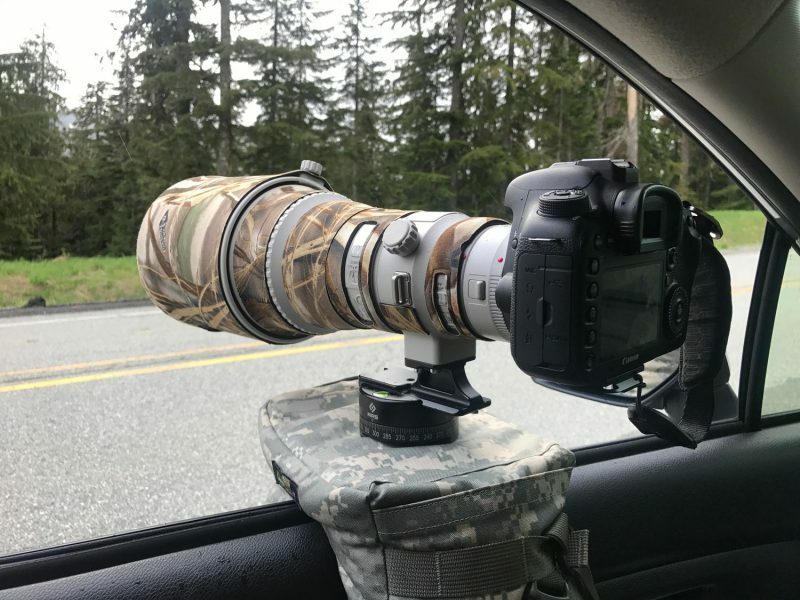 Side note: Those that have read my gimbal gear guide will know that I use an RRS PG-02 gimbal with my tripod for wildlife photography with big super telephoto lenses. For the curious amongst you, my ballhead of choice for the TFC-24L is the venerable BH-55 for my travel and landscape work. Although the smaller BH-40 is perhaps a bit more suited to the Series-2 RRS tripods in terms of size, I really like the larger controls on the BH-55. Since I live way up in the Canadian Yukon, I’m often wearing gloves while using it and it’s much easier with the larger head. You can read my complete guide to the entire Really Right Stuff ballhead lineup here. 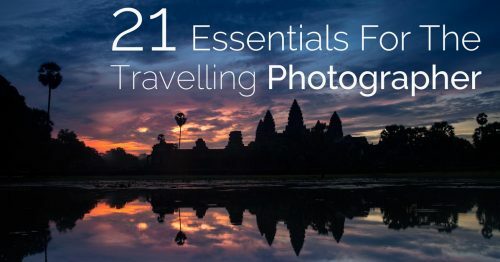 When you think of potentially useful accessories for your photography, your mind likely goes immediately to things like a backpack, a cable or remote shutter release, some filters or maybe a rain cover such as those I talked about in the extensive camera rain cover guide. Tripod accessories probably aren’t top of your list. I continually see people making the age-old mistake of buying a cheap tripod and ballhead for their $4000-$5000 camera setup, so it’s not surprising that little thought goes into things that can further improve your support equipment. Unlike some of my other gear guides like the recent (monumental) guide to the best camera straps, this one is a fairly quick read because there aren’t a great many accessories to consider. Consider them you should, though! If it’s on this list then it’s something I have tested and found useful myself. This table shows you the list of products that I’m going to be reviewing further in this guide. 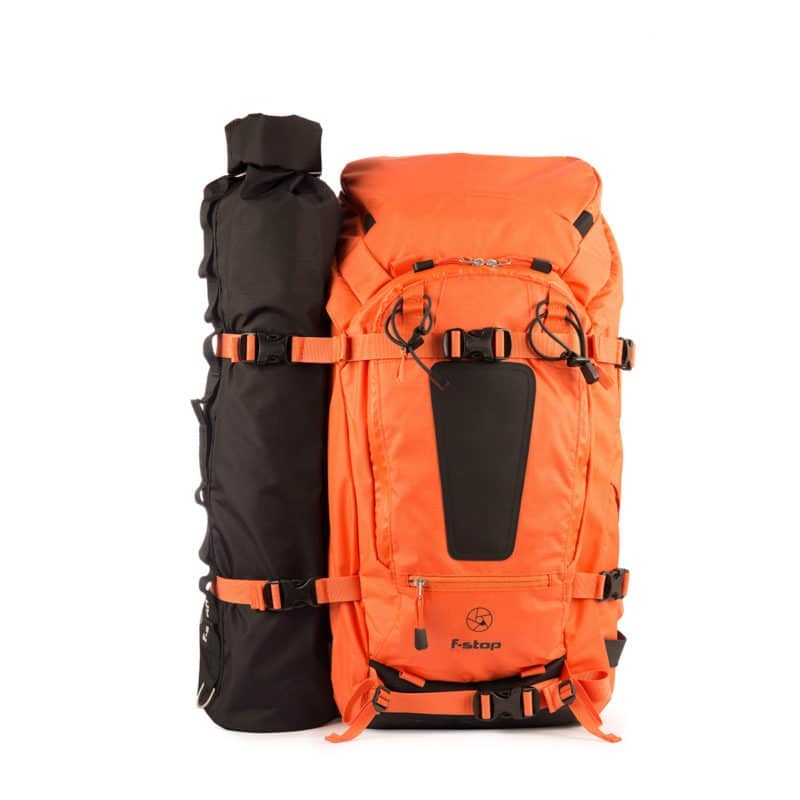 I didn’t choose these products blindly, so if it made it as far as being included in this gear guide at all then it has already shown merit during my own usage. If you don’t have time to read the more in-depth guide then these links might save you some time. 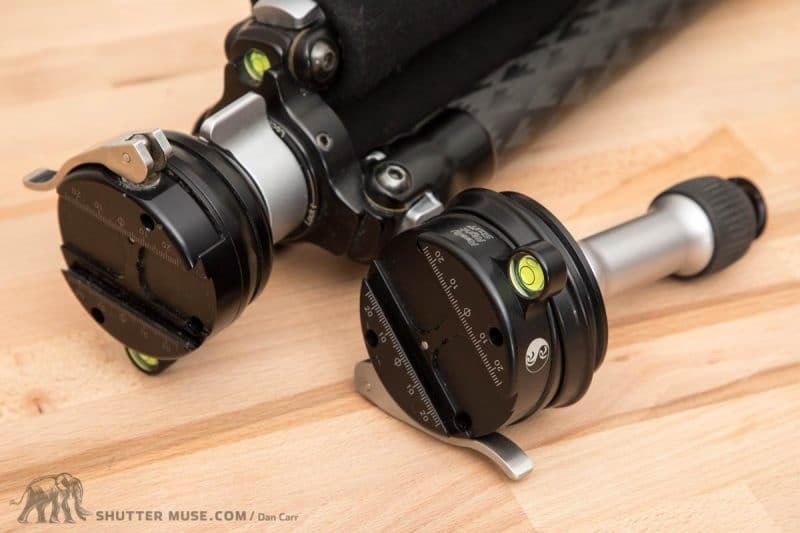 Most good tripods from major brands such as Manfroto, Benro, Induro, Gotzo, Really Right Stuff have a 3/8″ 16 threaded socket on the bottom of the legs for adding spikes. Spikes give you added stability in windy conditions or on loose surfaces, so they can lead to sharper images and in some cases could prevent your tripod from being accidentally knocked over in precarious positions. Benro make a good cheap set of spikes that I used to have with my carbon Benro tripod, and these are a great value option at just $20. These days I am using the much larger Really Right Stuff TA-3-FS spikes for three reasons: Firstly, I like to head to the Pacific coast when I can, and longer 3″ spikes work much better in the sand. Secondly, they have a hole in them that allows you to use a hex wrench as a lever for tightening them. 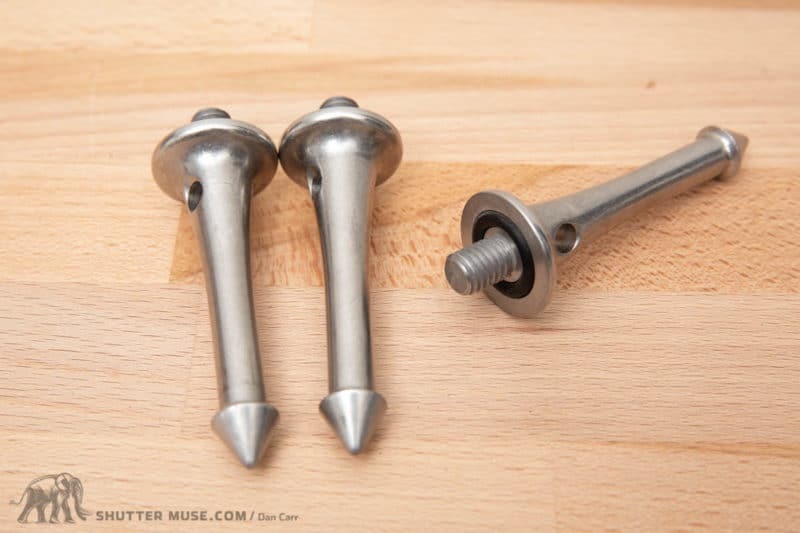 I always have a hex wrench with me for all my tripod plates, so it doesn’t necessitate carrying an additional tool with me as some other spikes do. Thirdly, the built-in rubber o-ring on them grips really tight and these things never come loose on their own! You get what you pay for. 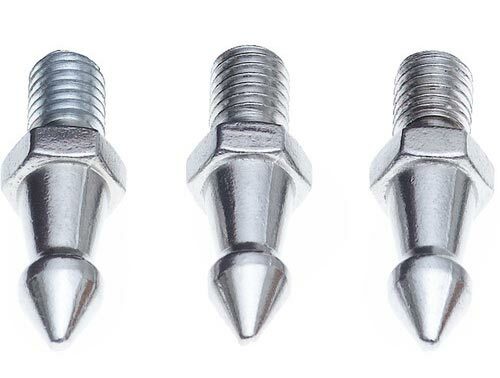 The $20 Benro spikes will do the trick for people on a budget, but there are some advantages to the RRS spikes which are considerably more expensive at $96/set. Note: Some tripod brands like Feisol use a metric thread system for their tripod feet and it means that the more common 3/8″ 16 threads will not fit. Check your tripod specifications before making a purchase! 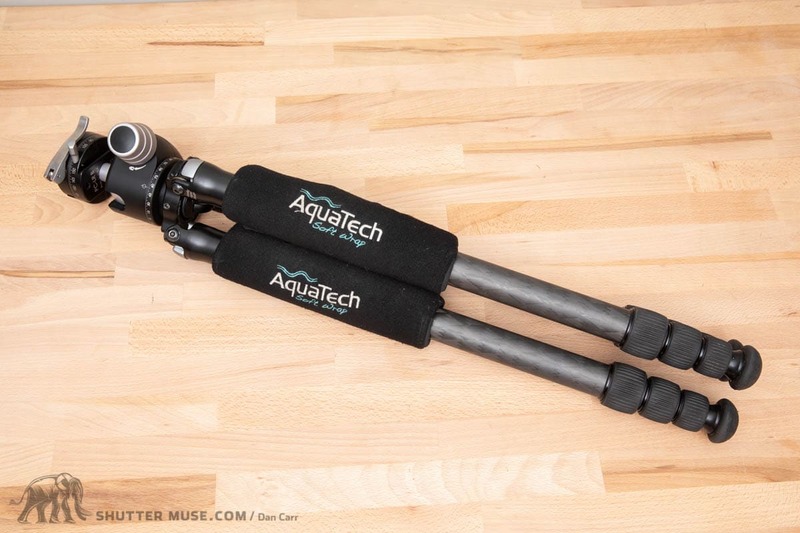 I bought a pair of Aquatech Soft Wraps many years ago when I got my first super telephoto lens. This was back in the day when I was shooting a lot of sports and it often meant long days on my feet lugging around a lot of gear. 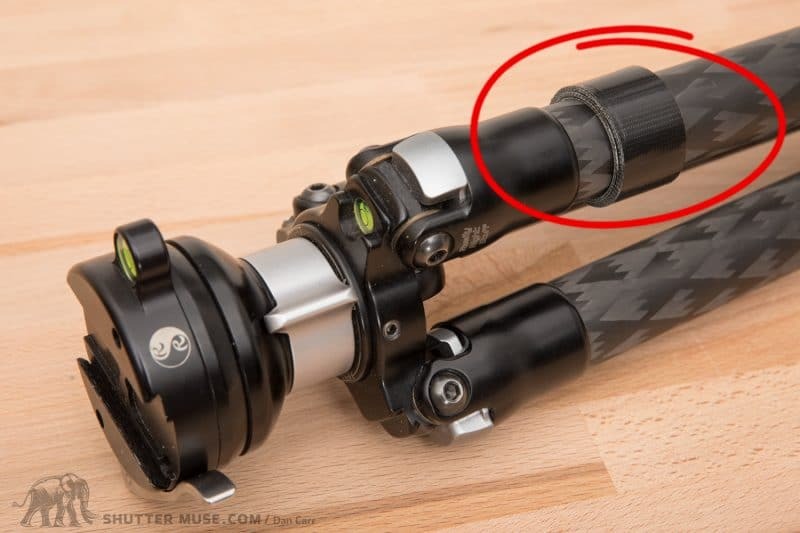 I’d regularly use one of the Soft Warps on my monopod when the job called for that, or put the pair of them on my tripod if the extra support was needed. The back of the wraps is a grippy rubber material to ensure the wraps do not slide up and down the tripod legs once installed. Believe me when I tell you that your body will thank you if you ever plan on walking more than a few minutes with a super telephoto lens balanced on your shoulder! Most people don’t have a lot of fat there and it’s easy to bruise. 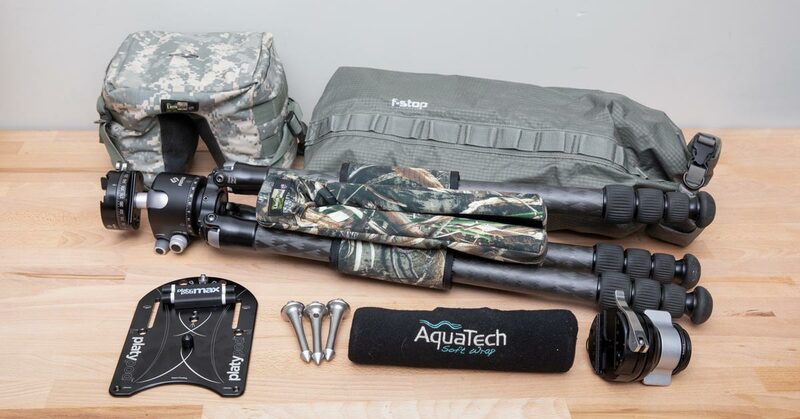 At $30 for a pair, or $20 for one (monopod only), the Aquatech Soft Wraps are a well-priced solution that will last years of repeated usage. Mine are a true testament to that with close to a decade of use now. The Aquatech Soft Wraps worked well for a long time, but I recently came across an even better solution for wildlife photographers, albeit one that is a little more expensive: The LensCoat LegCushion (approx. $60). 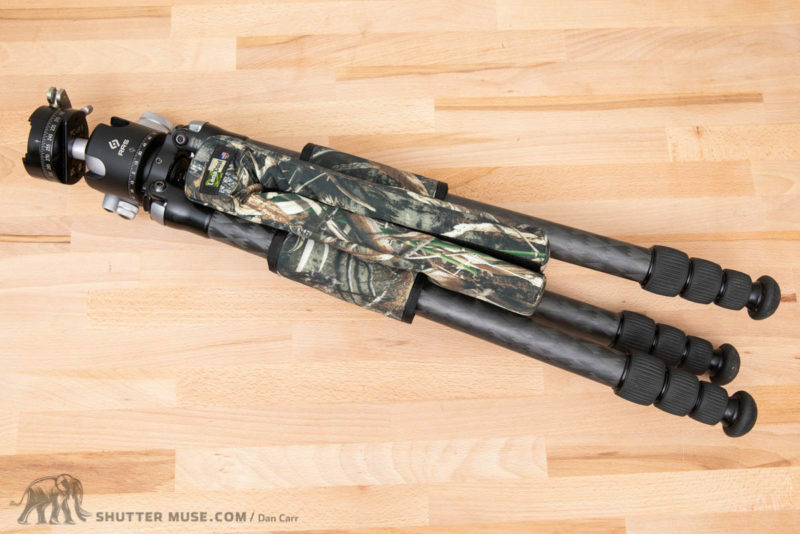 The LensCoat LegCusion allows you to carry your tripod and a mounted super telephoto lens, with the legs collapsed or extended. This makes it useful for moving small distances as you adjust the angle to your subject, and also for longer walks on your initial approach. With your shoulder wedged between the padding, your hand can firmly grip one of the tripod legs to steady the whole setup. Not only is this a comfortable way to carry things, but it also feels a lot more secure when you’re traversing tricky terrain. This was quite noticeable to me when I first used mine on a rocky shoreline that had me scrambling over rocks in search of coastal black bears. Carrying the tripod in this way also means the weight of your camera is pushing down into the tripod head, instead of at a right-angle to the tripod as it does when you just hang the tripod perpendicular to your body off the back of your shoulder. I know that will put some people’s minds more at ease, and I’ll no longer have nightmares about snapped tripod studs sending $10,000+ of gear smashing to the ground behind me! I love this solution for wildlife work where I’m not dealing with crowds of people and constantly walking through gates and doors. 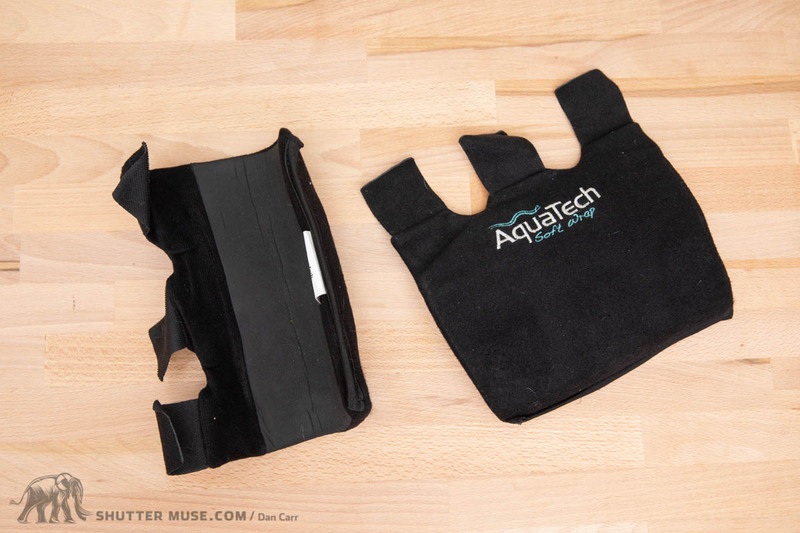 However, it would be impractical at sporting events, which is the reason why I have included the more traditional Aquatech Soft Wraps on the list as well as the LegCushion. Both excellent choices that suit slightly different situations. 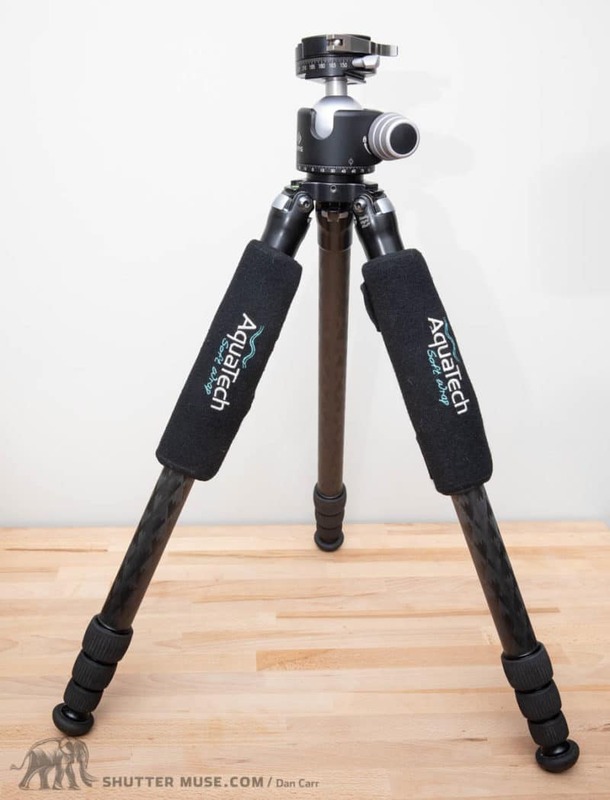 The biggest downside to the LegCushion is that you might not be able to close your tripod legs as far as you might be used to if you have a tripod with a relatively small distance between the tops of the legs at the apex (see photo above). 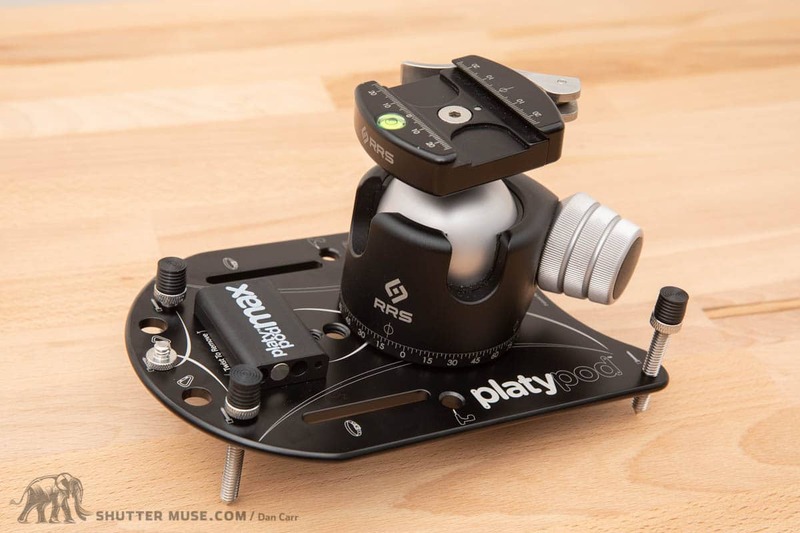 Series-3 tripods from Gitzo and RRS won’t have an issue, but anything smaller will. In the field this isn’t an issue as you won’t have the tripod legs closed, but unless you remove the LegCushion it’ll be harder to pack. 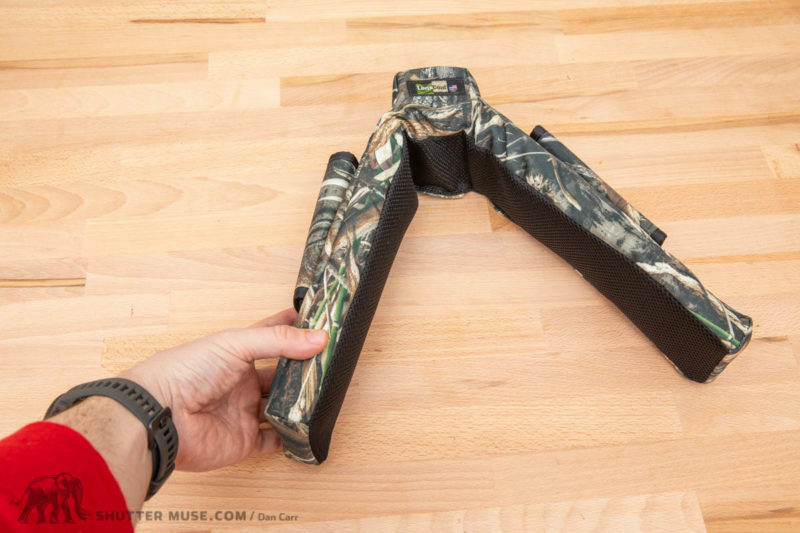 If you think that will really bug you, you should take a look at the LegWrap Pro instead – it’s a similar idea in terms of how you carry the tripod, but it offers a bit less padding. What I found was that in my car I didn’t bother to remove the padding but when I packed gear into duffles for travel I did need to remove it so that my tripod would fit into its protective case. 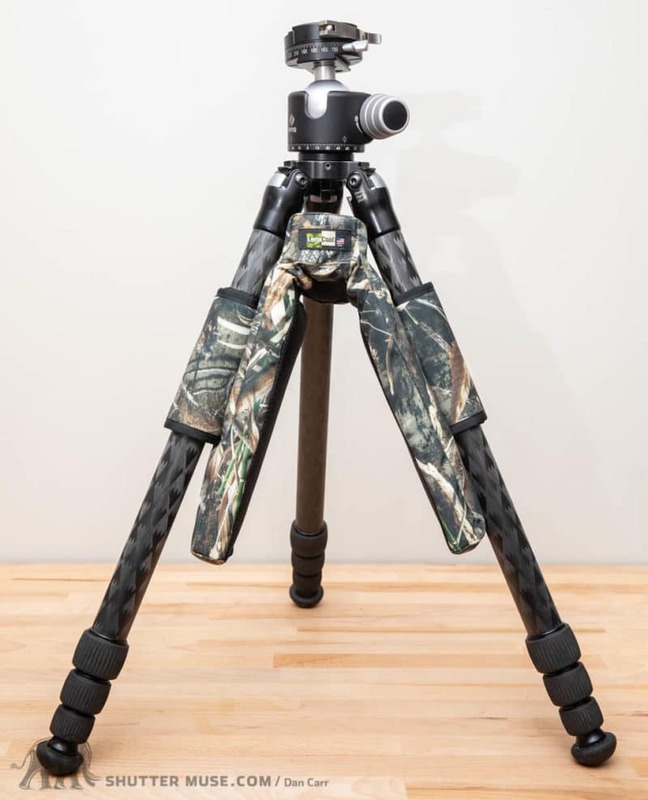 The LegCusions are available in a variety of camouflage patterns and different lengths to suit different sizes of tripod. I said I wouldn’t talk about ballheads or gimbal heads in this guide, but I do want to mention this levelling head. 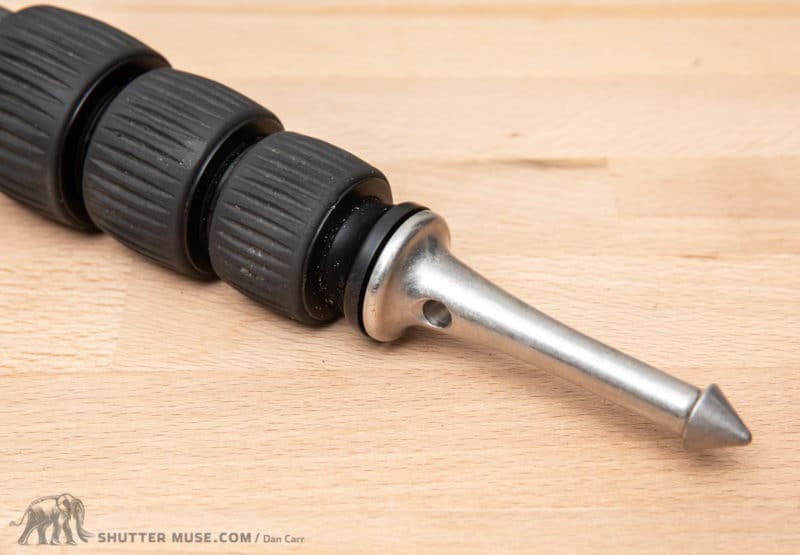 There really aren’t enough good levelling heads on the market for it to be worth doing a specific levelling head guide, so I’m just going to cut to the chase and talk about the best one: The Really Right Stuff Universal Levelling Base. A levelling head goes on top of a tripod and beneath your ballhead or gimbal. It has a locking collar that, when released, allows the top plate to be pivoted in all directions by roughly 30 degrees. This allows you to extend your tripod legs to get your tripod roughly level, and then complete the perfect levelling process quickly by releasing the locking collar and tweaking the platform angle using the bubble level. But why might you need a perfectly level tripod platform anyway? Can’t you just adjust the ballhead to level the camera? If you don’t have a perfectly level tripod for these three actions, the camera it will drift away from the horizontal as you pan. For panoramic photography it can ruin the final stitched image by curving it and making it tough to crop. For video shooting it’ll quickly ruin any shot, as the camera will be tilted and horizons will be wonky. For gimbal usage, a well-practiced photographer might be able to compensate for the vertical drift by simultaneously tilting the camera up or down, and rotating on the lens collar as they pan… but do you want to risk that during a once-in-a-lifetime moment? Theres is a little more room to correct this issue with gimbals, as you can rotate your image in the edit, but it generally makes high speed animal tracking much harder. Levelling heads are a standard feature for video-specific tripods with fluid heads, but for stills photography you’ll need to look for specific options. A few manufacturers make levelling heads that are bespoke for their tripods, but the Universal Levelling Head from RRS is tripod agnostic and can therefore come with you if you ever decide to get a different set of sticks. It’s not a cheap item, but the ability to move it around to different setups is great, and in the long run it might save you some money. Wildlife photographers with gimbals can certainly benefit from being able to move it from their tripod to a ground pod like a Platypod (see later in the list) and then to a car window beanbag just by unscrewing it from the standard 3/8″ 16 thread. This is the Vera version of the RRS levelling head. The only difference is that it integrates directly with RRS Series-2 tripod instead of simply screwing onto an 3/8′ 16 stud. 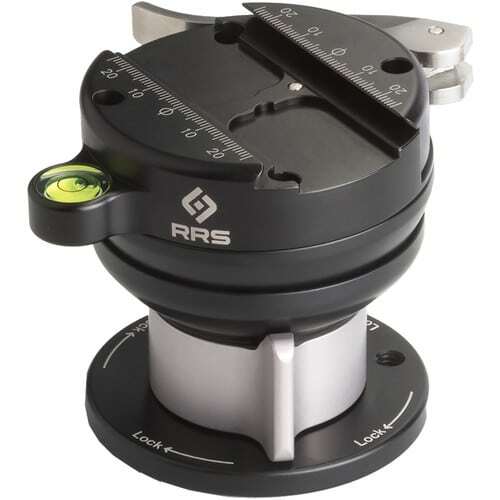 If you are using an RRS Series-2 tripod with the removable Versa Apex on it then you can get a Versa version of the very same levelling head. Let me tell you though, I did just that, and then afterwards I wished that I had got the universal version so that I could use it on my various other supports accessories. You live and learn! The RRS Universal Levelling Base is available in two version: One with a built-in Arca Swiss clamp, and one with 3/8″ 16 stud on it. If you plan on mounting a ballhead on it and leaving it there then you want the cheaper stud version. If you think you will constantly switch back and forth between a ballhead and a gimbal (as I do) then the Arca clamp version is useful when Arca plates are attached to your two heads. 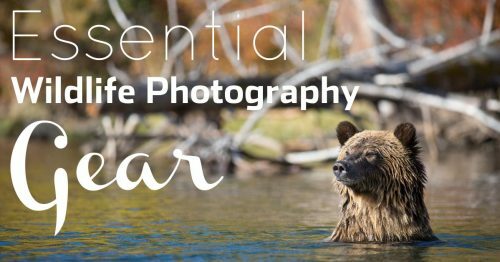 Getting down on the ground at eye level with animals is one of the fastest ways to improve your wildlife photography. It can be a bit cumbersome to do this with a large tripod though, and some tripods cannot go completely flat to the ground when their legs are fully splayed out. For this reason, a dedicated ground pod is a useful accessory, and you’ll also find it much easier to move if you are down on your belly and quietly shuffling along the ground to get closer to your subject. Macro photographers can also make use of them in areas where using a large tripod might interfere with the environment or creature that is being photographed. I first picked up my Platypod Max to uses as a baseplate for a remote wildlife camera (another excellent use) but have since kept it in my wildlife “go bag”. 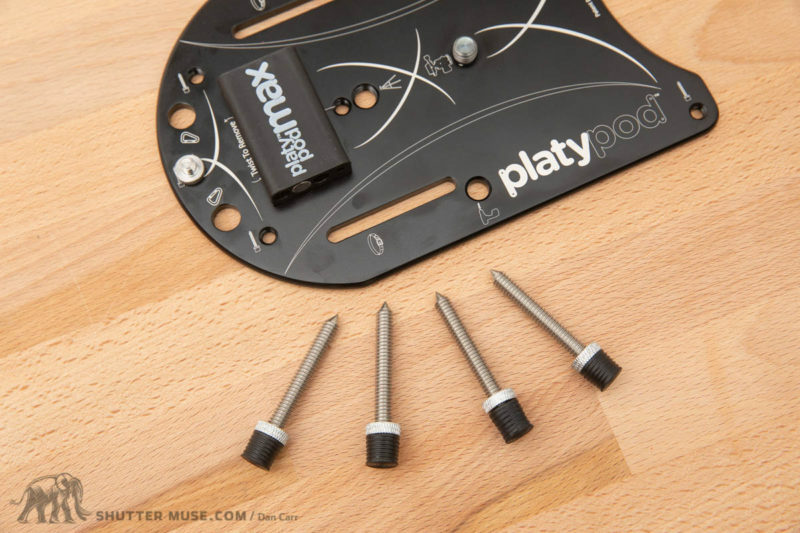 Whilst there are several other ground pods on the market, all of them are much larger and heavier than the Platypod Max. They key thing for me is that if I’m going to look for wildlife, this already means I have a huge super telephoto lens with me, as well as my gimbal and regular tripod. I just don’t have much room to carry anything else! With the Platypod, I can simply clip it to my bag with a carabiner, or slide it into a flat accessory pocket in one of my backpacks. The thin profile of the plate makes it really easy to store. Unlike some other options, the Platypod also has the optional spikes which are great for steadying things on soft ground, or levelling the plate on harder, uneven ground. As you can see from the photos, the plate has a standard 3/8″ 16 thread on it for installing a ballhead or gimbal. In the photo above you can see a fairly typical situation. A tripod with a small hook on the underside of the apex between the legs, and a camera backpack that is far too big to actually attach to the hook for the added stability. 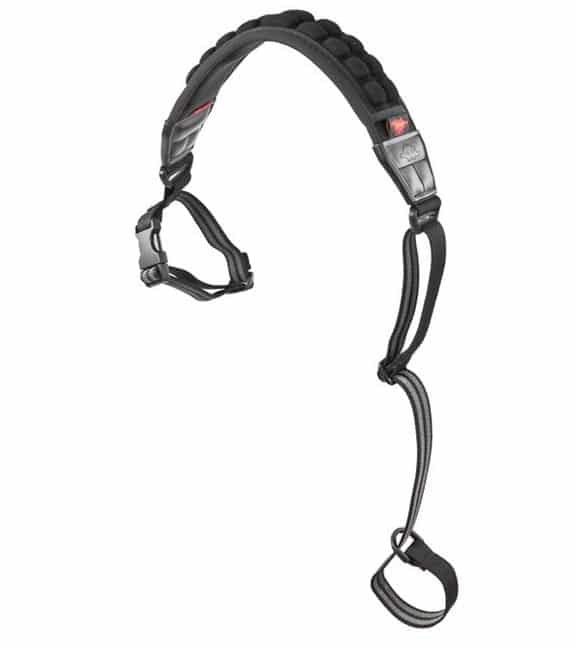 The solution is the Heroclip, a carabiner with a foldable hook ok it. 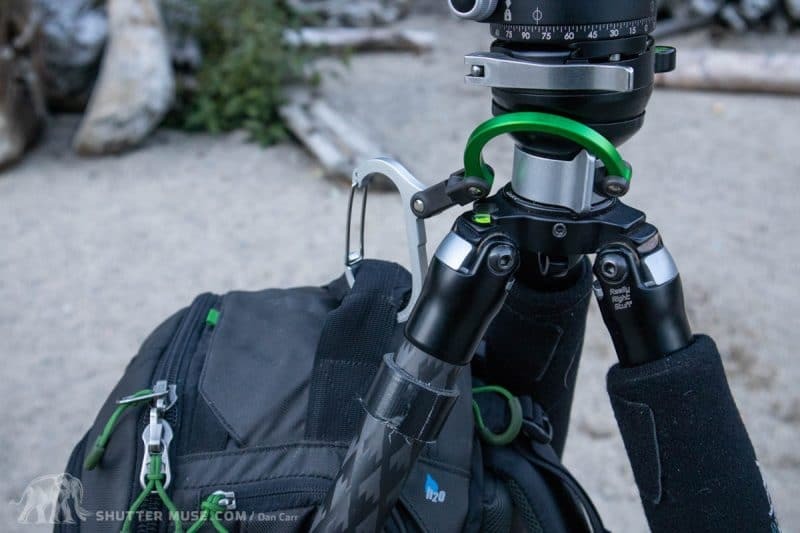 You could use a regular carabiner, but the Heroclip can also be used to hang up your camera bag in all sorts of places, and if your tripod doesn’t have a hook underneath it you can still use it in the way that I show you in the photo below. Here’s my very own LensSack in use while shooting some black bears in British Columbia. While I prefer to be out and about with my tripod when I’m shooting wildlife, sometimes there are opportunities that come out of nowhere when you’re driving along! Maybe you don’t have time to get out of your vehicle and set up a tripod, or maybe it’s too dangerous to do so. Available in various camouflage patterns. When that happens, I reach behind the driver’s seat of my car and grab my ever-present LensSack! I’ve had a couple of different beanbags over the years but settled on the LensSack as my bag of choice because of the removable metal plate on top of the bag. 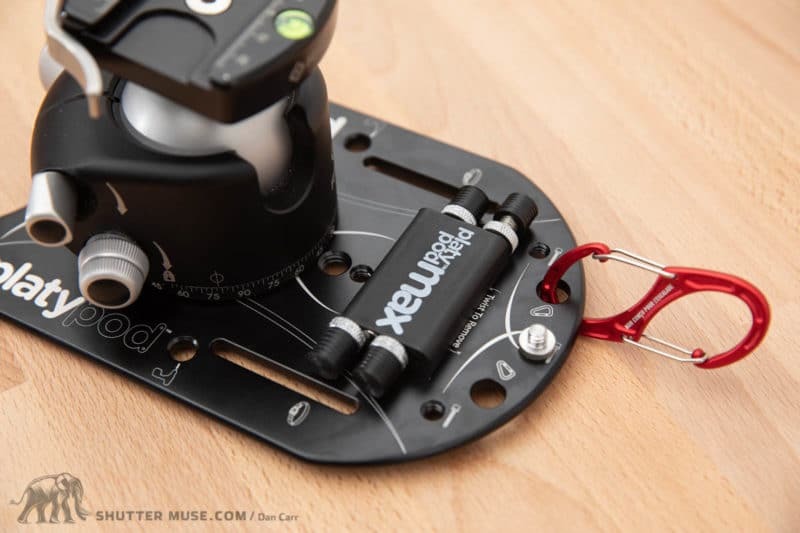 The plate has a 3/8″ 16 stud on it so that you can attach a ballhead or gimbal, which can definitely come in handy when you think you might be sitting in the same place for a while. If you want a less rigid surface and want to rest the lens barrel directly onto the bag, the metal plate with the stud on it slides right out (also handy to shave weight while traveling). For a 400mm f/2.8, a 500mm f/4 and a 600mm f/4 you’ll want the LensSack Pro. For smaller lenses such as a 300mm f/2.8, 400mm f/4 DO or 500mm f/5.6 PF you’ll probably be fine with the slightly smaller LensSack Pro Jr (seen in the above photo with my own 40mm f/4 DO II). Tripods need maintaining and the most important thing to do is occasionally dismantle the leg locking system and clean out sand and other particles from the screw-lock threads. I use an old toothbrush for this. 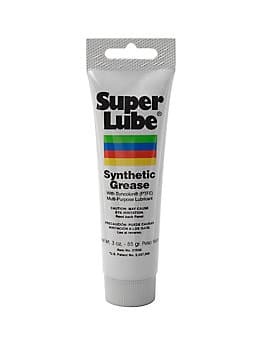 Once clean, they need to be lubricated before putting them back together, and SuperLube Synthetic Grease is the product that is recommended by Really Right Stuff. If it’s good enough for their tripods on initial assembly, this is the stuff you want to use during your own maintenance! You only need a small amount for each leg locking collar so a tube should last you a long time. A simple trick, but I like to keep some Gorilla Tape wrapped around the leg of my tripod just in case the awful happens one day and I end up breaking one of the legs in the field. Touch wood, I have never needed it, but that busted tripod legs aren’t the only thing that can be fixed with this stuff so I’m sure it’ll come in handy one day. 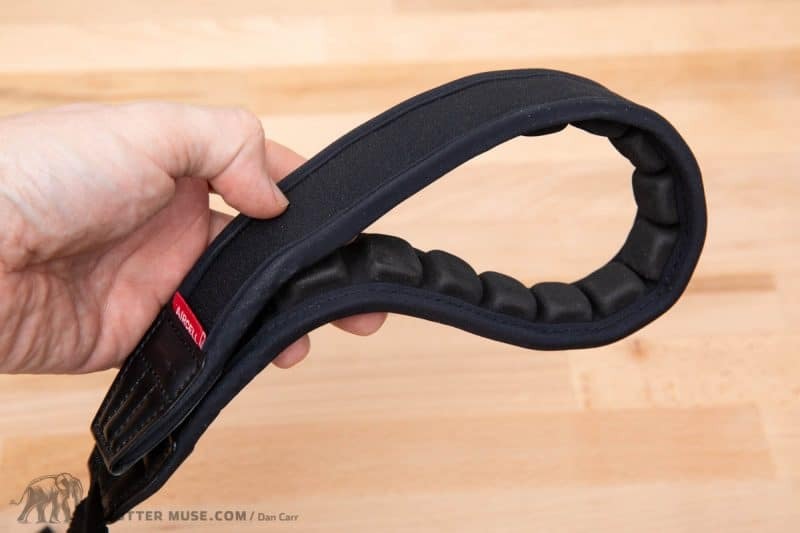 AirCell straps use little pockets of air for padding on the back of a stretchy neoprene strap. They are good value and extremely comfortable. The tripod version of the strap has two quick-release straps – one on either end – which loop around your tripod when it’s being carried. Once you need to use your tripod you will need to unclip at least one of those buckles to splay out the tripod legs, but you can leave the top one clipped on if you want. 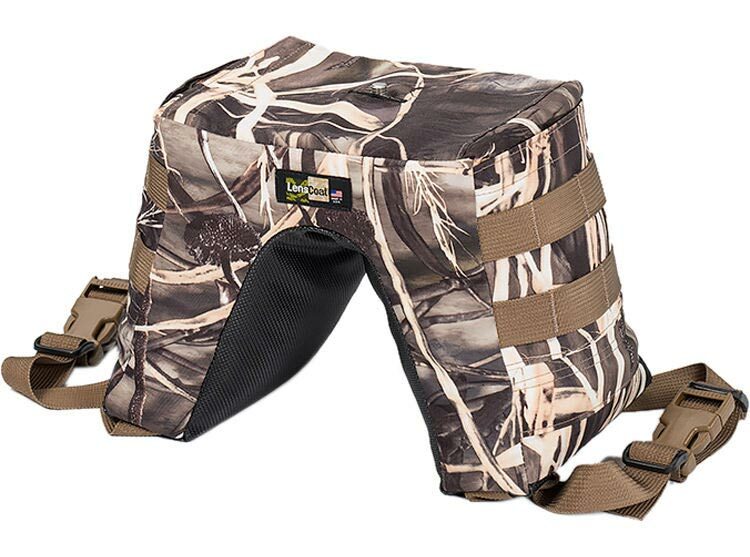 This simple tripod case is extremely durable and water resistant. It has daisy chain loops all down the side to help you attach it to a backpack, or attach a shoulder strap to the bag. The roll top closure system is also great because it allows you to carry a variety of tripod sizes with the same case, then simply roll up the excess material. The daisy chain on the bag makes it incredibly easy to find different ways to attach it to your favourite bag. This isn’t a padded case so it’s designed more for scratch and environmental protection, but mine has been going strong for close to a decade now! Note: I think they only make this in black now. The green one in the photos is, as I said, close to ten years old now I think. 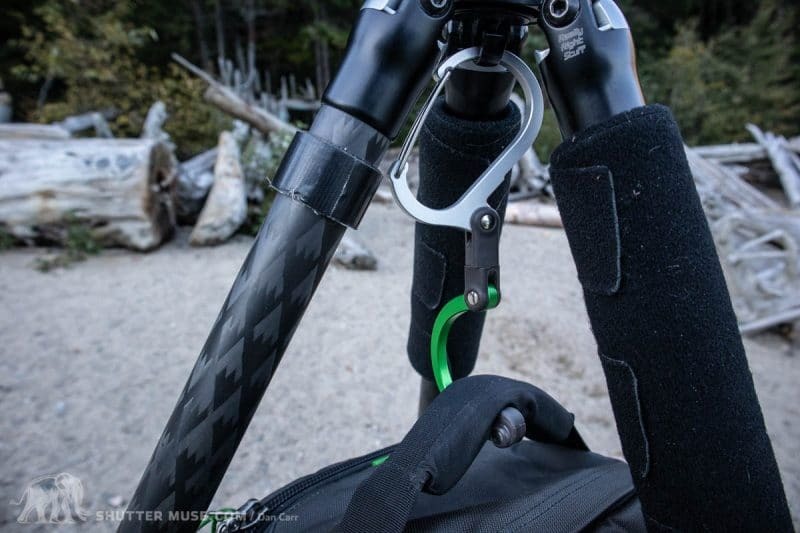 Super packable, useful and durable solution to protect expensive carbon tripods! Which Tripod or Support Accessories Do you Use? 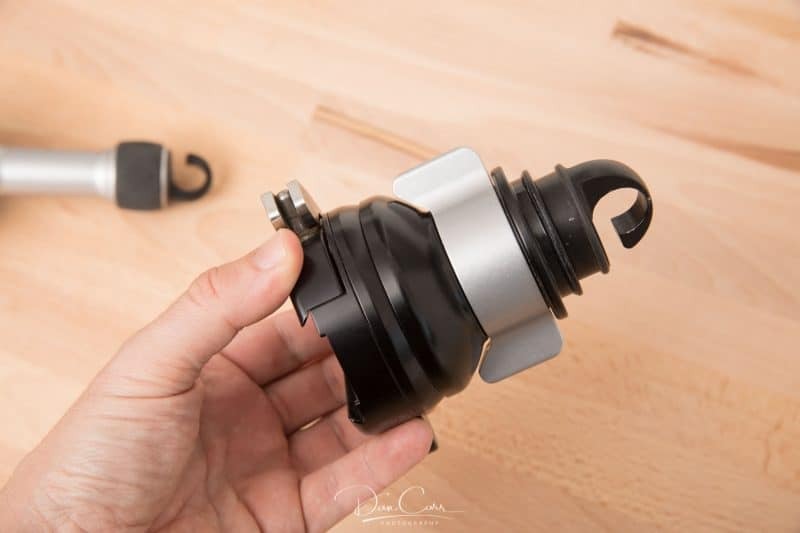 I spent a great deal of time testing and researching these accessories over the year to find what I believe to be the best solutions on the market right now, but it’s always great to hear from other photographers about their experiences. What kind of tripod or support accessories are you using, or which one are you thinking of buying? Does the entire system you describe here fit inside the F-Stop bag? 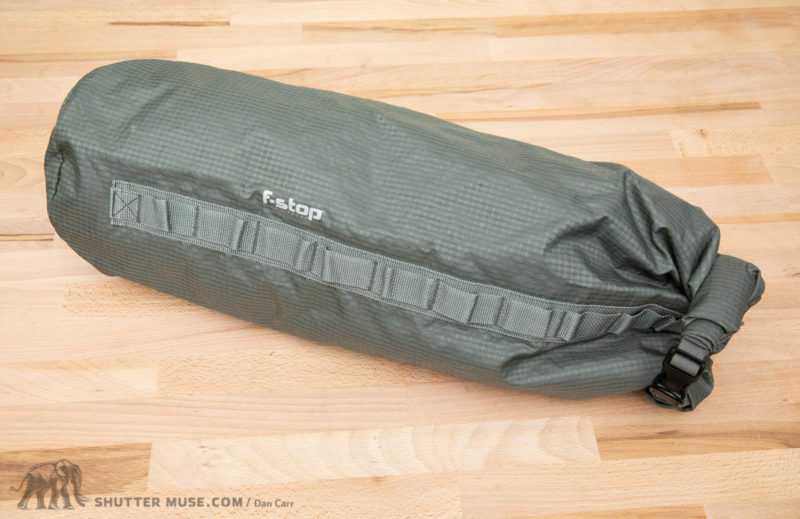 The F-Stop bag is pretty wide, so yes you could leave the leg pads on the tripod and fit into the F-Stop bag. You would not be able to fit the LensSack though. That thing is quite large, and when filled with buckwheat hulls it’s not compressible. Does that answer your question?